The annual New Year’s celebration hosted by the Japanese American Cultural and Community Center (JACCC) in Little Tokyo was held on Sunday. 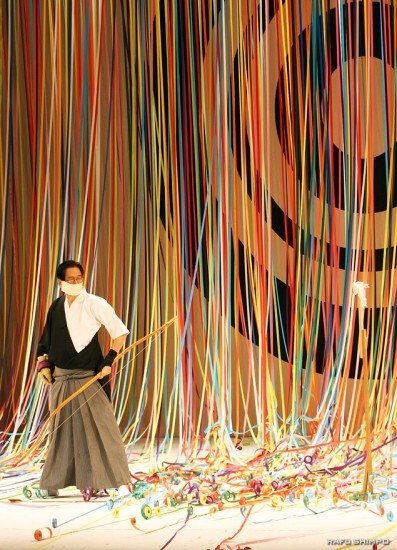 Entitled “Kotohajime,” the theme for this year’s celebration was “Hatsu-Mato” (First Target). Approximately 350 people came to see the various stage performances in the newly renovated Aratani Japan America Theatre. In addition, the 15th annual Shikishi Exhibition was launched. The exhibition features 130 shikishi (square papers) from Japan and the U.S., including pieces created by the 14th Dalai Lama and the late Nakamura Kanzaburo, a kabuki star who passed away this past December. The exhibition will run through until Feb. 24 at the Doizaki Gallery. The stage show opened with George Tetsuo Abe as Komuso (a monk of the Fuke School of Zen Buddhism during the Edo era) walking through a snowfall in an ancient town while playing the shakuhachi flute. 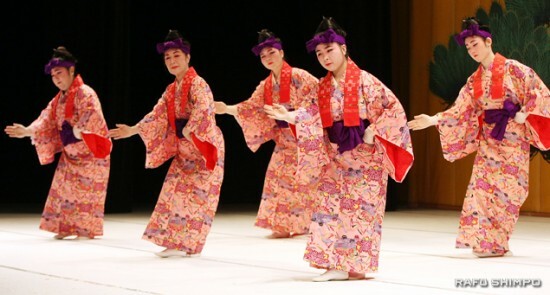 This was followed by the Kwan-Gyu Lim Dance Company’s performance of traditional Korean dance, the Colburn School’s Community School of Performing Arts’ modern dance performance, an Okinawan dance by the Majikina Honryu Ryubu Dojo, and the Ikkyu Japanese archery group. The last performance was the rite of purification conducted by Hirokazu Kosaka, artistic director of JACCC and also a Zen master. He pulled slowly back on the bow while the audience remained silent, waiting for the arrow to be released. 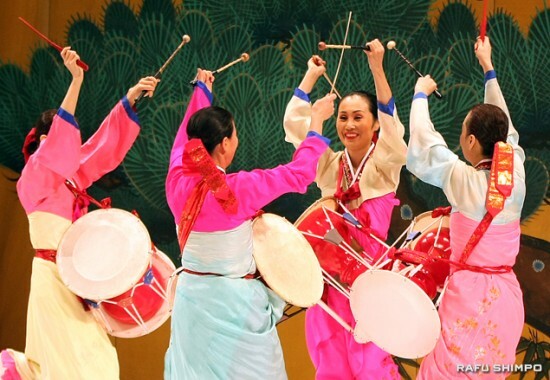 When the arrow hit the straw-rice bag with a deep thud, the audience burst into a big round of applause. Last August, JACCC Executive Director Greg Willis resigned and Watanabe was appointed the acting CEO. Sandy Sakamoto, JACCC board chairperson, greeted the audience in Japanese with “Akemashite Omedetou Gozaimasu,” and also noted that the last year was a challenging one for the JACCC. She also mentioned that this year’s “Kotohajime” ceremony is dedicated to the memory of Frances Hashimoto, long-time community activist and president of the confectionery company Mikawaya, who passed away in November. The kagamiwari ceremony was also held. 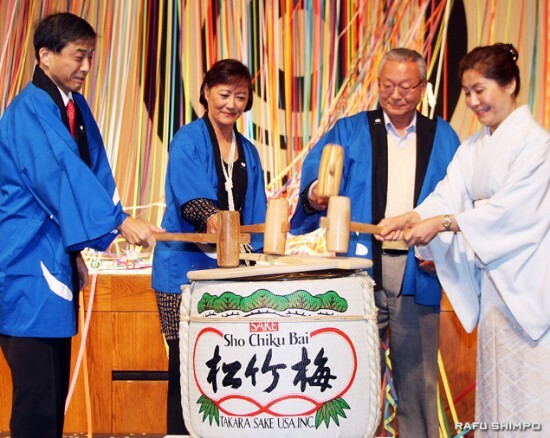 After a sake barrel was broken open, there was a toast with the audience, and then 200 kohaku (red and white) mochi were thrown from the stage to be caught by audience members wishing for good luck in the new year.